National Cancer Institute of Mexico. Identification of long non-coding RNAs (lncRNAs) involved in chromosomal instability in a model of prostate cancer. Rogelio Montiel Manríquez1; Cristian Arriaga Canon1; Luis Alonso Herrera1. 1Unidad de Investigación Biomédica en Cáncer, Instituto de Investigaciones Biomédicas-Instituto Nacional de Cancerología. Mexico City. rogeliomontiel [dot] bq [at] gmail [dot] com; herreram [at] biomedicas [dot] unam [dot] mx. In this study, we aim to identify new lncRNAs important for prostate carcinogenesis using RNA-seq data, and study whether those transcripts could be involved in chromosomal instability (CIN) and purpose new possible lncRNA-based biomarkers for prostate cancer prognosis. Using RNA-seq data from two prostate cell lines, neoplastic (LNCaP) and non-neoplastic (PrEC), we have identified a new lncRNA adjacent to CEP55 (centrosomal protein 55), a gene associated with chromosomal instability. This lncRNA, which we have named lncRNA-CEP55, is 1.6 kb long and it is downregulated in the neoplastic cell line, this is also seen in the adjacent coding gene, CEP55, where the expression decreases in the neoplastic line suggesting a possible role of the loss of this transcript in carcinogenesis. This new lncRNA could be regulating CEP55 expression in these cell lines. Changes in expression of CEP55 has been associated to CIN in other cancer cell lines. Another lncRNA with differential expression in both cell lines has been identified, lncRNA-RFC4 is an annotated gene in the human genome GRCh38/hg38, but it has not been studied in cancer. This lncRNA is highly expressed in LNCaP cell line whereas its expression is very low in PrEC cell line, which suggests a possible role of this lncRNA in cancer development. This lncRNA is 4.3 kb away from RFC4 (Replication Factor C Subunit 4), a protein coding gene related to mismatch repair and DNA Double-Strand Break Repair, abnormalities in this coding gene have been associated with CIN in other cancers. 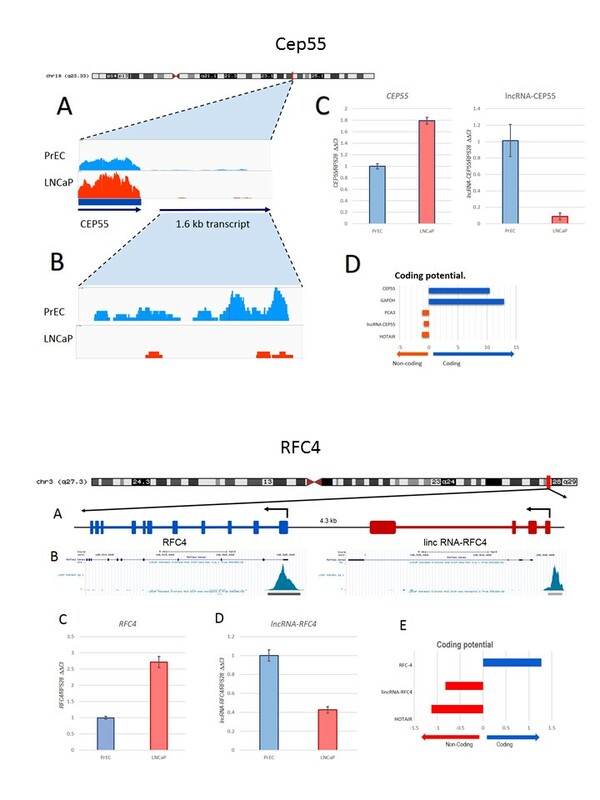 lncRNA-RFC4 could be playing an important role in the cis regulation of RFC4 gene. lncRNA-CEP55 and lncRNA-RFC4 are important targets of study because of its differential expression in both cell lines and their possible association with these lncRNAs could be playing an essential role in regulating the expression of the adjacent genes related to chromosomal instability, an enabling characteristic that facilitates the acquisition of the hallmarks of cancer, further analysis is needed to validate their mechanism of action and their potential use as prognostic biomarkers in prostate cancer. The role of lncRNAs as drivers of CIN in CaP is a promising field to understand CaP progression and are promising biomarkers in this disease.